Part of an exciting series of sturdy, square-box 1000-piece jigsaw puzzles from Flame Tree, featuring powerful and popular works of art. 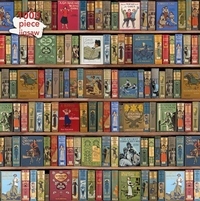 This new jigsaw will satisfy your need for a challenge, with the beautiful Bodleian Library: High Jinks Bookshelves. This 1000 piece jigsaw is intended for adults and children over 13 years. Not suitable for children under 3 years due to small parts.